DIY shaving: no sweat right? Overall, the process seems simple– lather, shave, rinse, repeat. But let’s get real, razor burns or stubborn stubble happens more often than we’d like. Guys, for a smooth shave we need to get back the basics. Timing is everything. During or right after a shower is the ideal time to shave for two reasons: hair is totally saturated, and the time spent under the hot water opens up the pores. Either way, keep gentle cleanser on the skin for one minute before rinsing. Then use a shave brush to apply a thick layer of shaving cream or gel and let sit for at least two minutes to soften the hairs and moisturize the skin. With a sharp razor, apply gentle pressure and shave with the grain. When you apply firm pressure or shave against the grain, irritation may result. If you find one pass doesn’t do it, it might be time to switch blades. Disposable razors – regardless of quality or number of blades – are generally good for two weeks of daily shaving. After shaving, always rinse with cold water and apply moisturizer or aftershave when the skin is slightly damp for maximum moisturizing effect. Then treat yo self to a weekly clay mask treatment at home or at your favorite salon or spa. And if you’re not already, start exfoliating every one to two weeks. 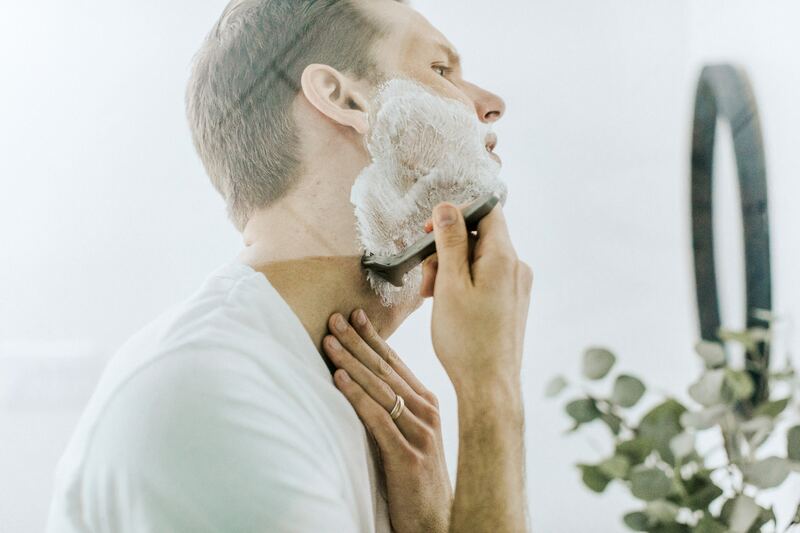 For many men, a chemical cleanser with salicylic acid can exfoliate as well as a scrub and do so with less chance of irritation. Perhaps the ultimate treat yo self treat is a professional straight razor shave. In the hands of a skilled barber, a straight razor shave is like a spa experience. Barbers apply hot towels and heated shaving cream (often of their own special recipe) to deeply moisturize the skin and soften hairs. The straight razor will give you the smoothest shave possible. Some treatments even come with massages.